For any enterprise the issue of data leakage is crucial. Many companies rely on emails and unsecure platforms to share and transfer their data, but these systems are highly unsecure and can be hacked. This means that your files can be: copied – misused – stolen by third parties. Regardless of company’s size, security efforts must be taken to ensure that sensitive data are kept secure and confidential across the company and while collaborating with external partners. The risk is the same both for large enterprise and for small-medium-sized business, but the approach is different. Large companies tend to rise barriers that might block the entire operations, on the other side small companies remains unaware of the risks. Emergency situations somentimes require quic and easy document sharing and rsecure access to emote resources. Collaborating efficiently between remote teams, saving costs and valuable time that’s offen wasted on lengthy trips. Improve the productivity and safety of the collaboration between colleagues, for a project, a due diligence, a new acquisition, the launch of a product, the protection of a patent. Improve the relationship with your customers, by offering a higher quality of service, through which you can shorten the distance, communicating through video conference, responding quickly via chat, wherever your customer are and whatever mobile device they use, but always preserving confidentiality of the information. Access to important documents when you travel, avoiding unothorized access in which you might incurr while using email and open source software. Communication among top managers of strategic and delicate decisions for the company. Using a safe room, where to present project and under patent product, services, ideas. Coordinate the quick and easy sharing of patient information, diagnosis and examinations among health professionals. Collaborate efficiently between teams spread across multiple locations, saving costs and valuable time, which is often wasted on grueling journeys. Lawyers can access documents via desktop computers, laptops, smartphones or tablets, bringing the office always with them. No more problems related to the size limit of files sent by e-mail and version control. Sharing and collaboration of documents quickly and securely with customers and partners, becomes a high value added. Powerful search and tagging capabilities allow you to find content more easily and quickly. Business professionals often require quick access to confidential corporate documents, while they are travelling. 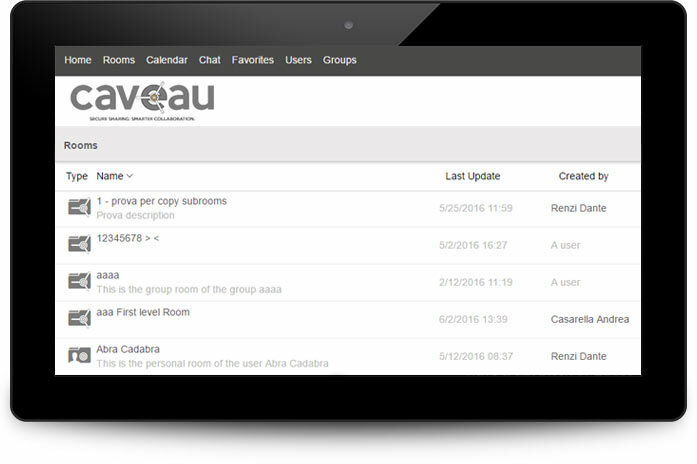 A secure and centralized document archive, such as Caveau, ensures you can locate, in your virtual safe boxes, what you need at your finger tips, while also protecting your data against unsecured email traffic and unauthorized access. © AGORA SecureWare SA - Via Campagna 30 – 6934 Bioggio, Switzerland - All rights reserved.